Swingline Finger Tips are constructed of high grade rubber and feature extra thick material at tip to provide maximum durability. The nubbed surface ensures better gripping. Amber in color; multiple sizes available to guarantee a close fit. 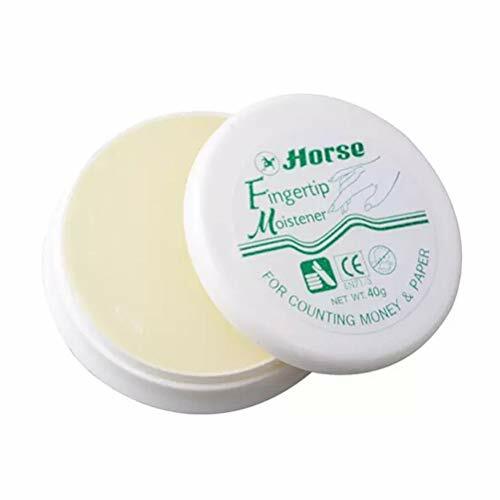 Klingy 3/8 Ounce Fingertip Moistener Fingertip moistener is made with safe, natural glycerin to provide just enough moisture for a positive grip. Hygienic, odorless, greaseless moistener will not stain paper or clothes. Fingertip moistener has nonskid back. SAFE, NOT-TOXIC: Fingertip moistener is made with safe, natural glycerin to provide just enough moisture for a positive grip. NO MORE LICKING FINGERS: Moisturizers are a perfect solution for counting money, documents, papers, dollar bills. 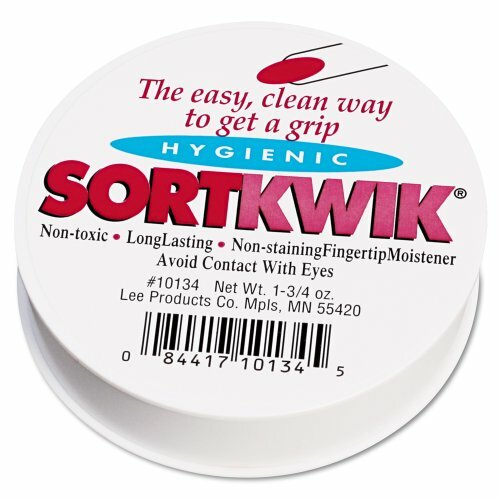 The Lee SortKwik Fingertip Moistener is a powerful grip enhancer, providing a positive hold for all your counting, filing, collating and sorting tasks. With SortKwik, you are able to get all your money and paper handling tasks done with greater ease and speed. The patented antimicrobial ingredient offers superior hygienic protection. The product is non-toxic, odorless and won't stain skin, paper or clothes. Includes 3 containers of the .375 oz SortKwik. Brand: Lee Products Co. | Manufacturer: Lee Products Co.
Tough, high quality tips last a long time. Surface nubs ensure positive grip. Extra thick material at tip for longer wear. High grade rubber for added durability. Material(s): Rubber; Size Group: 12; Medium/Large; Open End Inside Diameter: 11/16 in; Color(s): Amber. Tough, high quality tips last a long time. Surface nubs ensure positive grip. Extra thick material at tip for longer wear. High grade rubber for added durability. Tough, high quality tips last a long time. 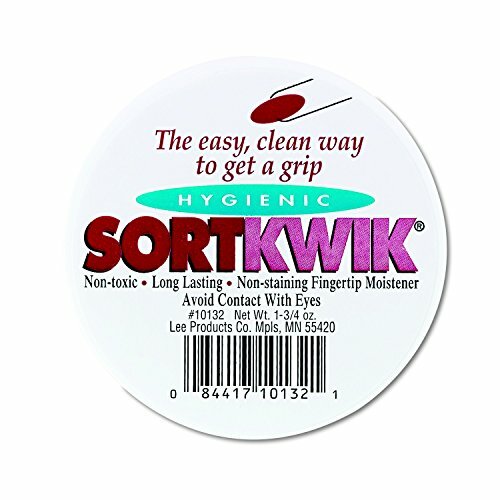 The Lee SortKwik Fingertip Moistener is a powerful grip enhancer, providing a positive hold for all your counting, filing, collating and sorting tasks. With SortKwik, you are able to get all your money and paper handling tasks done with greater ease and speed. The patented antimicrobial ingredient offers superior hygienic protection. The product is non-toxic, odorless and won't stain skin, paper or clothes. 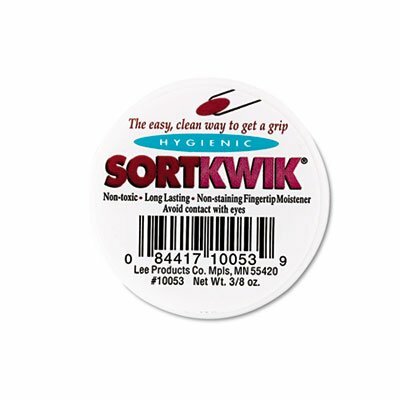 Includes 2 containers of the 1.75 oz SortKwik. Tough, high quality tips last a long time. Surface nubs ensure positive grip. Extra thick material at tip for longer wear. High grade rubber for added durability. Material(s): Rubber; Size Group: 13; Large; Open End Inside Diameter: 3/4""; Color(s): Amber. Swingline Finger Tips are constructed of high grade rubber and feature extra thick material at tip to provide maximum durability. The nubbed surface ensures better gripping of thin sheets. Tips are amber in color and large; size 12. Twelve finger tips per box. Other sizes are sizes available to guarantee a close fit. Swingline's Business Essentials collection has every type of product needed to get the job done right! Available in a variety of sizes, colors, shapes and materials - these products hold and organize your documents! The Swingline Rubber Finger Tips are specially designed to last longer. These premium fasteners use extra material and high-grade rubber for longer wear. They have a unique design that lasts four times longer than ordinary rubber finger tips. They are constructed with a top grade material that will not stretch out of shape or become slippery. The surface nubs of the amber colored Swingline Rubber Finger Tips ensure positive grip and quick, efficient handling. They are available in five different sizes for a custom fit. These tough, high-quality grip finger tips last a long time! Every little detail leads to success, and these small products from Swingline's Business Essentials can help make big impressions! The Lee Tippi Micro Gel Fingertip Grips make sorting, collating, filing and picking up papers easy. The Fingertip Grips are made of durable, flexible, washable, latex-free material. The unique design allows for breathability and comfort while increasing hand performance and reducing muscle stress. 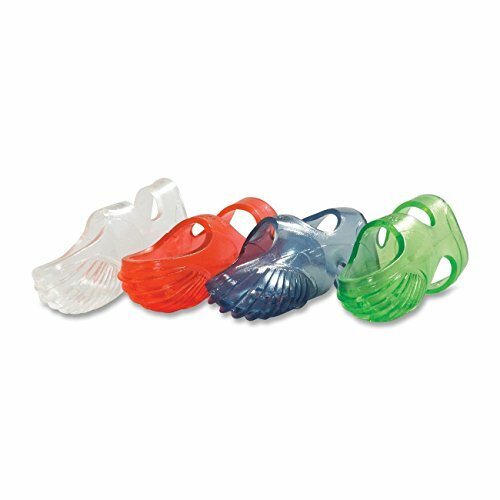 Package contains 10 Micro Gel Grips in assorted colors and sizes (2 Blue Size 3, XS - 9/16"; 3 Pink Size 5, S - 5/8"; 3 Clear Size 7, M - 11/16"; 2 Green Size 9, L - 3/4"). Grip everything with ease and comfort! As a leading provider in grip technology, Griply was created to make sorting, filing, and picking up items easier and more efficient. Whether you're flipping through papers, playing guitar, sewing or anything else involving your hands, you can rest assured you'll remain in control with our rubber finger pads. Constructed with our proprietary blend of silicone free rubber materials, our ring design and patented diamond weave texture will ensure you'll always have the strongest grip. Our unique design not only provides a protective barrier, but is comfortable and durable, increasing your hand performance and reducing muscle tension. Available in a variety of sizes, our breathable and sweat-free finger pads are the most optimal cost-effective gripping tool out there. LATEX FREE! Rings can be gently stretched for a more loose fit. Each box contains ten (10) strong, durable and reusable rubber finger pads. 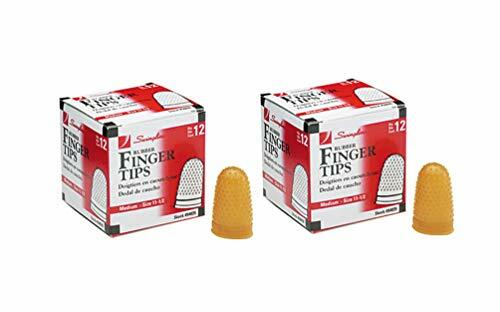 Designed for comfort and durability, these finger rubber tips provide a protective barrier between your fingers and the items you're holding, preventing paper cuts, making filing and sorting faster and easier, and so much more. Acting like second-skin, the fingertip ring is made from a proprietary blend of heavy duty, comfortable and silicone-free rubber materials. Patented ring design and open top makes these finger pads comfortable enough to leave on regardless of what you are doing - no need to take them on and off between typing, using phones, or writing. They are light, breathable and sweat-free, making them comfortable for long term use. 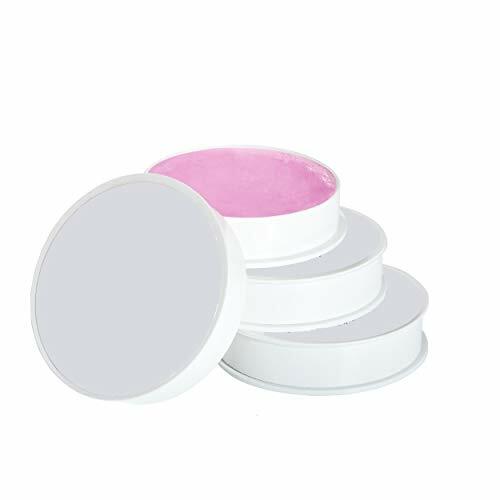 Lee Fingertip White/Pink Anti-Bacterial Moistener with a non-skid back comes in a container of 1-3/4 oz capacity providing a positive grip for easy and accurate counting of currency, collating and sorting of paper. Moistener contains a patented antimicrobial ingredient for more hygienic protection. Nontoxic and odorless fingertip moistener does not stain skin, paper or clothing and contains humidity-absorbent blotter. Contains 50% recycled content. 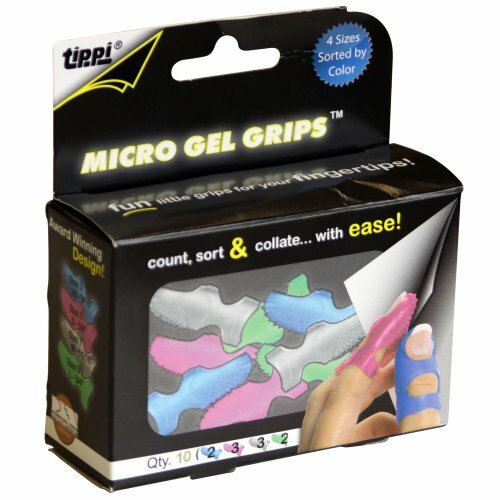 The Lee Tippi Micro Gel Fingertip Grips make sorting, collating, filing and picking up papers easy. The Fingertip Grips are made of durable, flexible, washable, latex-free material. The unique design allows breathability and comfort while increasing hand performance and reducing muscle stress. Package contains 10 Micro Gel Grips in assorted colors in Size 5 (diameter of base is roughly 5/8 inch). The LEE Tippi Micro Gel Fingertip Grips make sorting, collating, filing and picking up papers easy. The Fingertip Grips are made of durable, flexible, washable, latex-free material. The unique design allows breathability and comfort while increasing hand performance and reducing muscle stress. Package contains 10 Micro Gel Grips in assorted colors in Size 3 (diameter of base is roughly 9/16 inch). has an open end inside diameter of 5/8". has an open end inside diameter of 11/16". This Swingline 54035 size 11 1/2 (Medium) amber rubber finger tip is ideal for clerical work, bookkeeping, accounting, and other tasks that involve piles of paperwork! With its durable rubber design and textured surface, you can easily grip pages for fast flipping while avoiding painful papercuts. 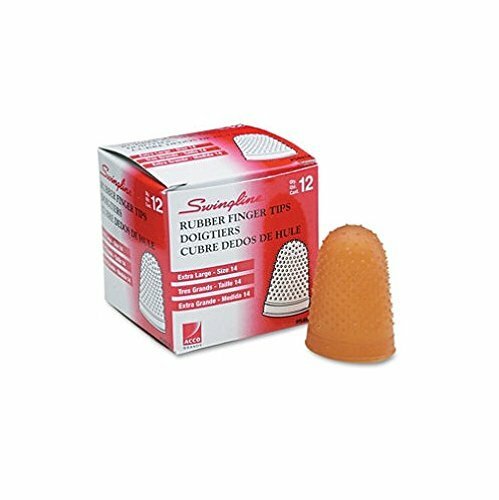 Made of high-quality, extra thick rubber, this tip is a must-have for offices. It has an open end inside diameter of 5/8". The environmentally friendly non-toxic formula makes the product have a unique antibacterial and bactericidal effect. Once you apply the wax paste, you can count more than 100 banknotes, greatly improve the office efficiency, and have been confirmed in the banking system for many times. It is a high-speed manual point-of-sale weapon. No stains, add aloe vera to skin care and moisturizing. Quickly count banknotes and paper, and easily open various films. Patented antimicrobial ingredient for more hygienic protection Provides a positive grip for counting, filing, collating and sorting. Nontoxic, odorless and stainless. Protective blotter. Moistener Size : 1 3/4 oz.